I recently had the chance to attend a Nokia Canada announcement event at Air Canada Club alongside a handful of other Toronto music + culture bloggers. The invite wasn’t clear on what the event was for – just that they would be making an announcement, Alan Cross was a guest speaker, and we were invited to stay for The Killers show happening a little later in the evening. I’ll never turn down a free concert – yes, even a free Killers concert. Surprise, surprise, I am eating my words from last fall where I talked about how horrid The Killers are live. Yes, when I saw them WAY back in 2004 they were indeed horrible. But almost a decade later, they have learned from all that bad press and found their groove. Thank god. Playing to a stadium sounding the way they did in 2004 – charging what they now charge – would be a joke. There’s something to be said about road experience. They have it now, along with a huge budget to back it up (and maybe ensure the auto-tuning that happens on the album is in place during the show, so Brandon’s vocals actually hold up). Beyond the fact that vocally, he sounded worlds better than what I remembered, his stage presence was off the charts. No longer was he just singing songs and not looking at the audience, acting too cool for anyone. No, he was the picture of a leading man – introducing every song, interacting with the audience, building the energy up, running around the stage, having fun with the band – he was in complete control. It was like I was looking at a completely different performer – there really is no comparison with the brooding Vegas douche who needed vocal lessons that I witnessed during the Hot Fuss tour. They also smartly stuck to the hits – meaning it was still a Hot Fuss heavy set, which made it extra nostalgic and enjoyable for me, since I tuned out after that album. Anyhow – back to my original reason for being there. As it were, the event was to announce the release of Nokia Music in Canada. The speakers for the evening were delayed because the Killers decided to soundcheck at the exact same time the event was scheduled – I’ve never seen a band soundcheck a huge empty venue before (or watched a show from the ACC Club box seats), so that was actually kinda neat. When it did begin, Alan Cross told us about the future of mobile music, and how Nokia Music has done what (in my opinion) Apple should have done a long time ago, and is offering up free access to their massive music collection with the purchase of any of their Windows smartphones. I wondered what the catch was, because free music services always seem to have a catch – but the only catch is that you have to buy the phone. As it should be. Of course, they do need to make money to pay the artists, so if you want to avoid the 6 song skip limit I grudgingly endure with Songza on my Android, you can subscribe for unlimited skips. Definitely worth it. 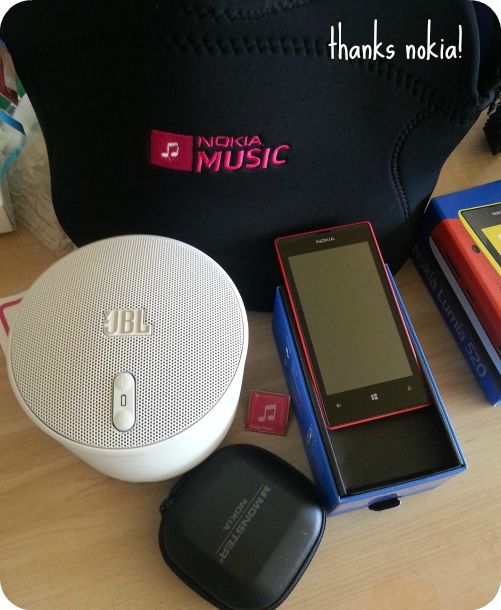 They gave all the bloggers at the event a Nokia Lumia 520 to take home so we could personally try out Nokia Music – along with an amazing wireless speaker from JBL, Monster earbuds, and a one year subscription to Nokia Music. I have made it no secret that I do not enjoy Windows 8 and its weird unnecessary app start screen in place of the start button – so I was skeptical about a Windows smartphone to say the least – but after playing with it for a couple weeks I can officially say it’s a solid (and very affordable!) smartphone. For one – it looks 100x prettier than both the Android, iPhone and Blackberry (all of which I have owned at one point). The way it lets you personalize the screen is, for me, the most attractive of all the smartphones by far. The way that Windows 8 fails as a desktop, it wins as a smartphone. It makes perfect sense to have an attractive app home screen on your phone. Nokia Music is amazing, because not only can you listen to all the music you want – it will take a look at your personal music collection and recommend artists for you to listen to. You can also make custom mixes from your favourite artists. 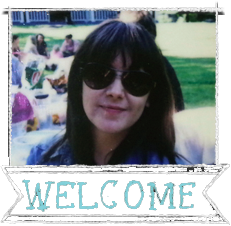 I made a ‘Broken Social Scene, Elliott Smith, Nirvana’ mix that purely played only songs I love – something that doesn’t happen so much on my other music apps. The BEST part? You can download mixes right onto your phone so you don’t need a data connection to listen. Do I need to repeat that? The worst part about Songza is that it cuts out in the subway when my data connection cuts off, leaving me music free. There’s no need to worry about such a situation happening with Nokia Music. This is particularly awesome for me as it means I can listen to my mixes when I take Mr Bojangles on walks, even though I haven’t switched my phone service over. The Windows phone definitely wins against my Android in terms of music performance, beauty/simplicity of the layout and homescreen, and touchscreen ability (you can use it with GLOVES ON). But, I am hesitant to switch over until they acquire an Instagram app. That is the whole reason I got an Android in the first place. They already have all the other necessary apps – Instagram is the only one I would legitimately miss out on. But this is the first incarnation of the Windows smartphone so there is a lot of room for improvement on all the apps. I can’t wait to see where Nokia and Windows go with these new smartphones. I can definitely see myself switching over soon enough. The music alone is a good enough reason. Have you tried Nokia Music? Would you consider switching over?